Funny how the days speed along .. I quite lose track of the date and have to check with the paper or Outlook or the bottom right corner of my little Asus to see the numbered day of the week. Cool, being retired. In my previous life (since I began working during my summer jobs which began with my 15th birthday and continued till (ahem) a little over 2 years ago … the date and the time was paramount in my life. Tied to the hands of a clock and a calendar, I sped through the weeks, months, years that carried me along as I struggled to keep up with all the things that life brought me. Work. Fun. Love. Gardening. And it’s the last 3 that carried over into my retirement phase. Love of my darling and fun DH who makes my life such a wonderful experience. Fun … yeah .. laughing and enjoying all that this most wonderful world has to offer. Gardening. 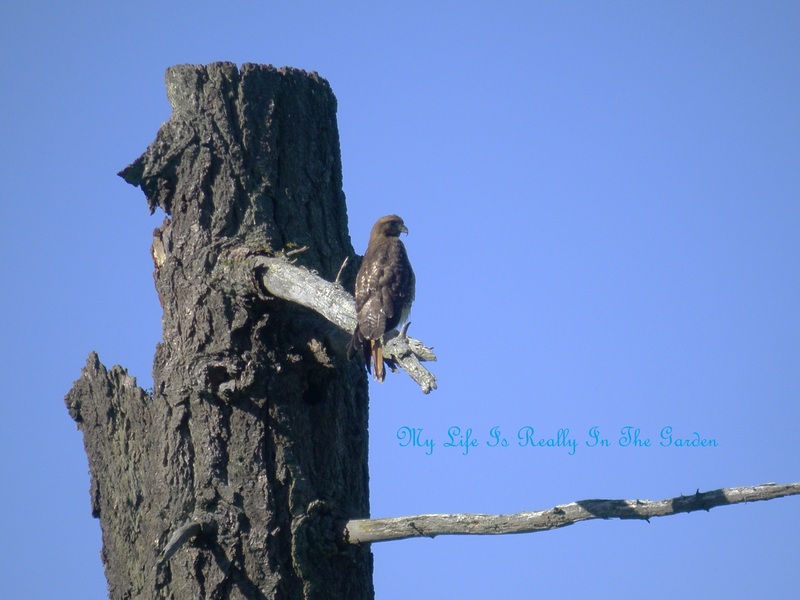 A universe that fills my life with it’s wondrous beauty, adventures,insight into the many sub stratas of insect, bird, plants, seeds .. oh how I love this part of my life. 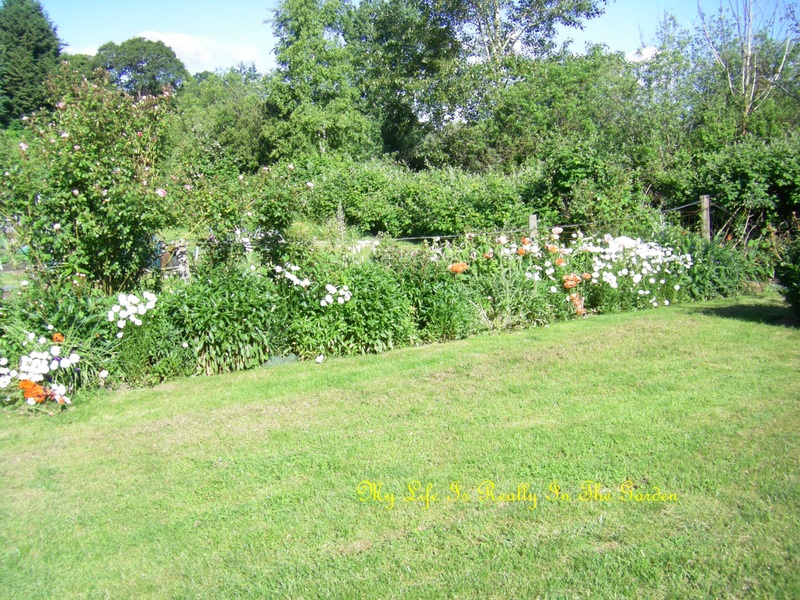 Lately I’ve been very occupied with sorting out our yard .. the sides, the back and next, the front. Quite enjoying the transformation and all that is entailed with that. And part of my lovely life includes the most marvellous fun of flying .. high in the sky .. my DH at the controls and I at his side, the co-pilot who is able to snap pics and enjoy the beauty of being aloft and floating like a feather through the air. 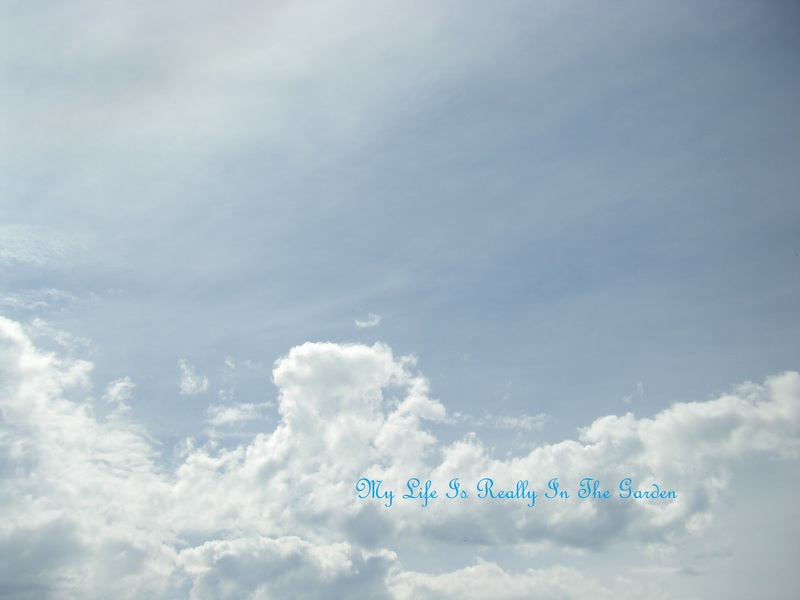 This leads to the activity of sky-gazing and quite often I spend so much time when I “should” be gardening .. looking upwards at the ever-changing scenery of clouds, plane watching, bird sightings .. all those terrific things that happen in the air. 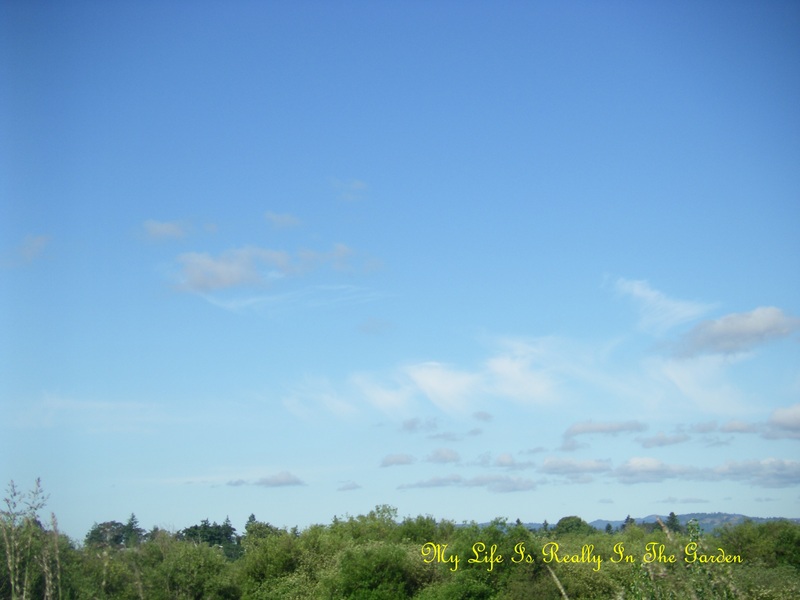 Now here is a sky-shot from yesterday.. how very magnificent and ever changing ..
and .. like .. wow ….open welcoming sky arms .. I embrace you …. and then .. back to the garden .. some play time! ok … earthward bound now. For just a little while I have no concerns about what to plant where. No worries about weeding. Where watering is needed. Sorting out plant pots to give away .. I do have quite a supply. I just simply played. My pal D and I had wandered around the Sooke Harbour House (beautiful) gardens and saw many playful art sculptures in the garden. One that I particularly liked was the random placement of pots on a length of rebar. A few days ago I was perusing Pinterest and came upon the same design. So I thought .. well, I have the rebar, I have the pots, I have the time .. so a perfect opportunity to create some art in the garden! 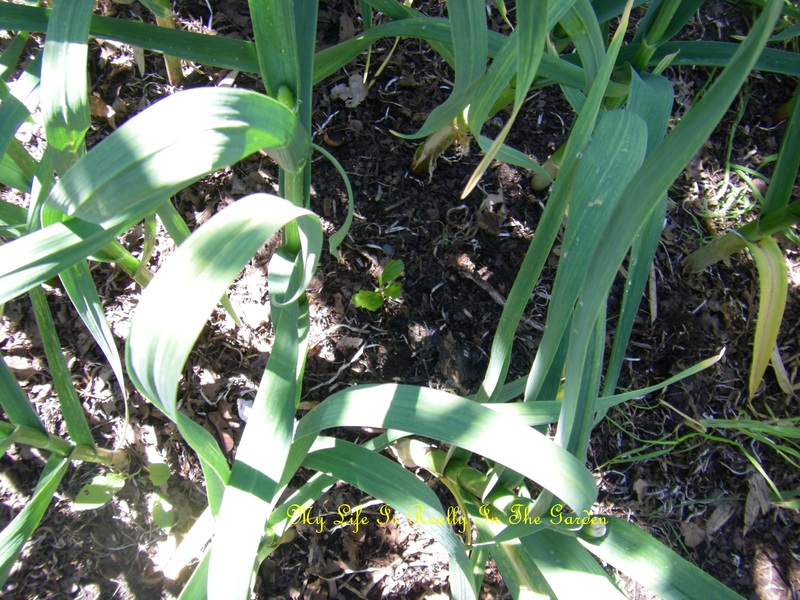 I had a clear area in the garlic forest, where I had recently dug up some garlic .. and here is where the fun began. And I am so fired up about this type of gardening that I am really hooked!! So very, very simple. Select a length of rebar, hammer into the gr0und (at least a foot into the soil, to better stabilize the column of pots). Place the largest pot over the rebar, settle on the ground and fill with soil. Add another pot. And so on. As each pot is filled, it’s a piece of cake to position the next pot at an angle. 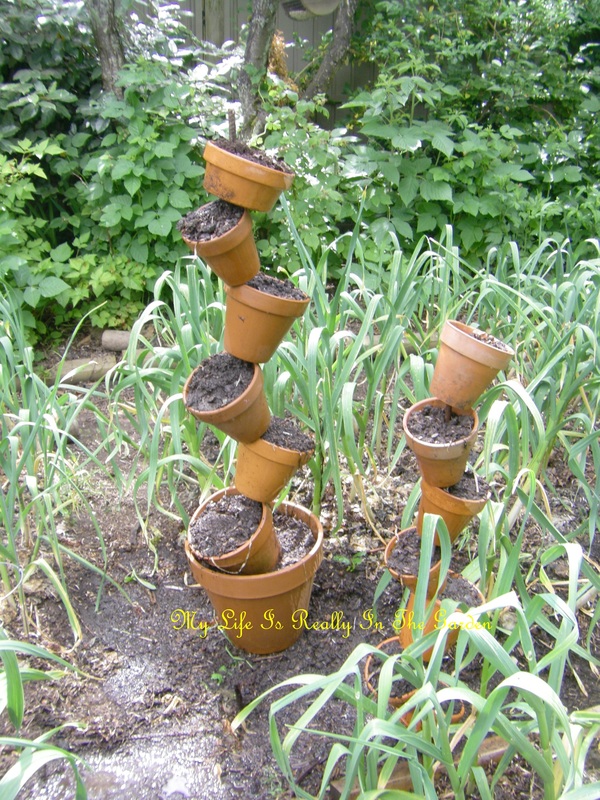 On my first column I realized later that I could have balanced the second pot on the edge of the first pot and would have had more planting area. sigh. Oh well. D told me that people add designs, colour, text .. on the pots. Exciting … more worlds to explore. And that reminds me .. I have a very large supply of sparkly beads, tiles, all kinds of wonderous things that I could decorate pots with … the possibilities, as they say – are endless!!! Anyway. I planted 2 of these, sowed the seeds, labelled and now will await the results. This is so fun, I just love this! … lots and lots of ideas about this type of gardening . … how very very energizing! Oh, almost forgot .. 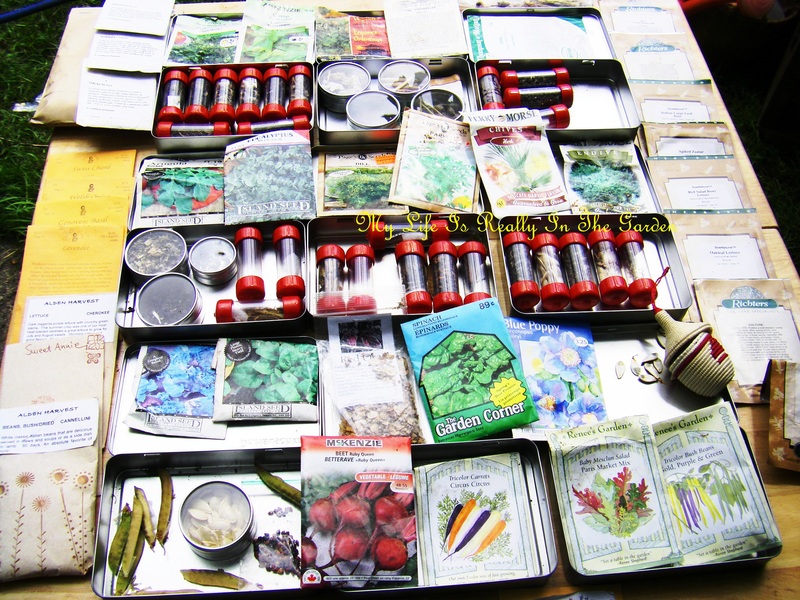 I brought out my seed supplies and began sorting them out onto my newly purchased gardening table .. more on another day about that!!! 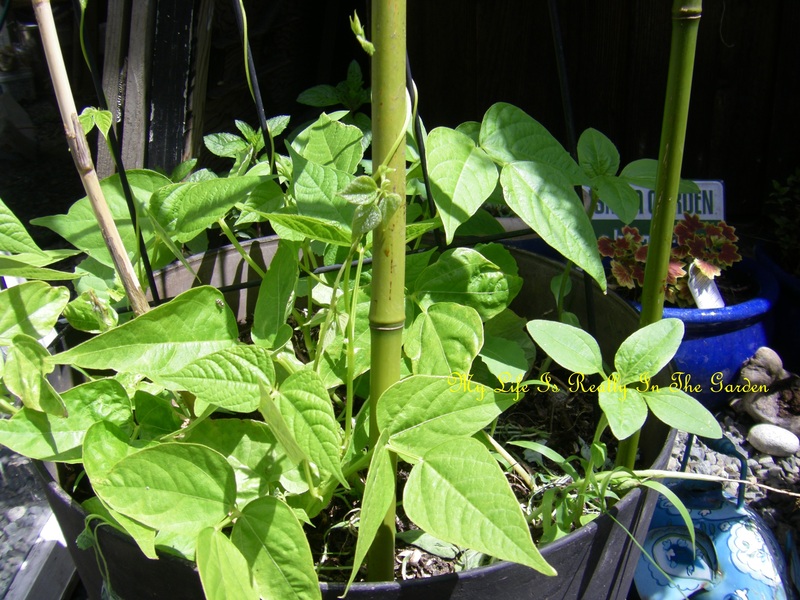 I placed some bamboo lengths in the “Kentucky Wonder Beans” and overnight they began climbing!!! The magic of nature at work. And .. look at the most beautiful Art Deco teacup and saucer that D just bought! 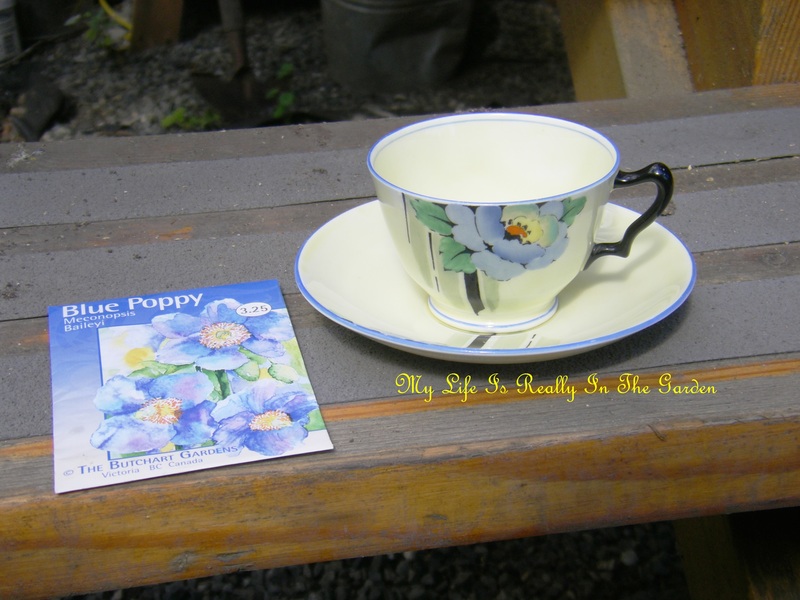 It matches the Blue Poppy seed packet that I picked up at the Butchart Gardens! Very striking. Well … time is marching on .. time to go about my day …just thought I would share some of my happy moments .. lots more to come .. 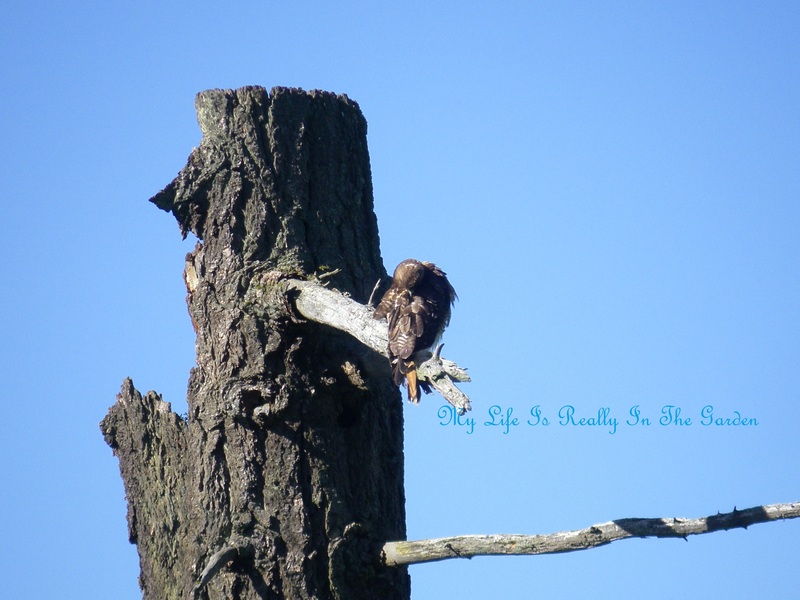 I have been quite busy taking photos and love to share them! 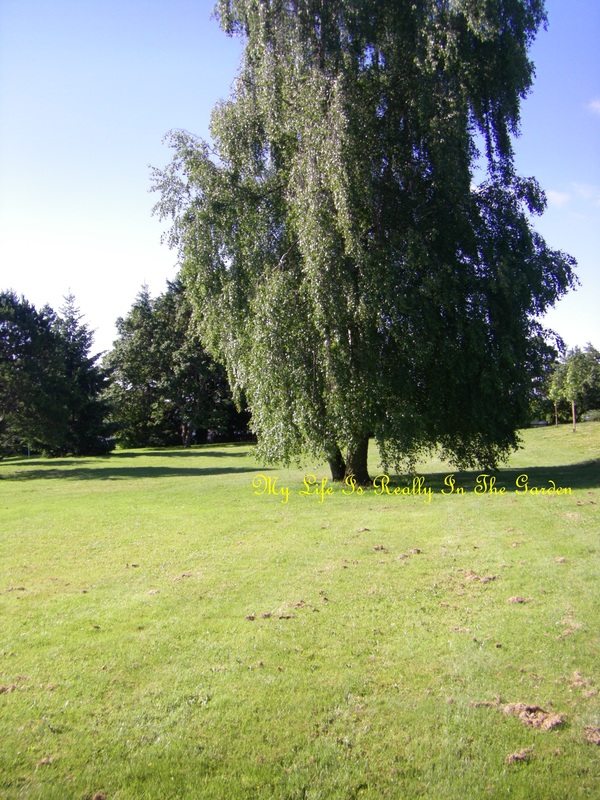 Categories: Gardening | Tags: bird sightings, hands of a clock, nature, plants, retirement phase, sky shot | Permalink. 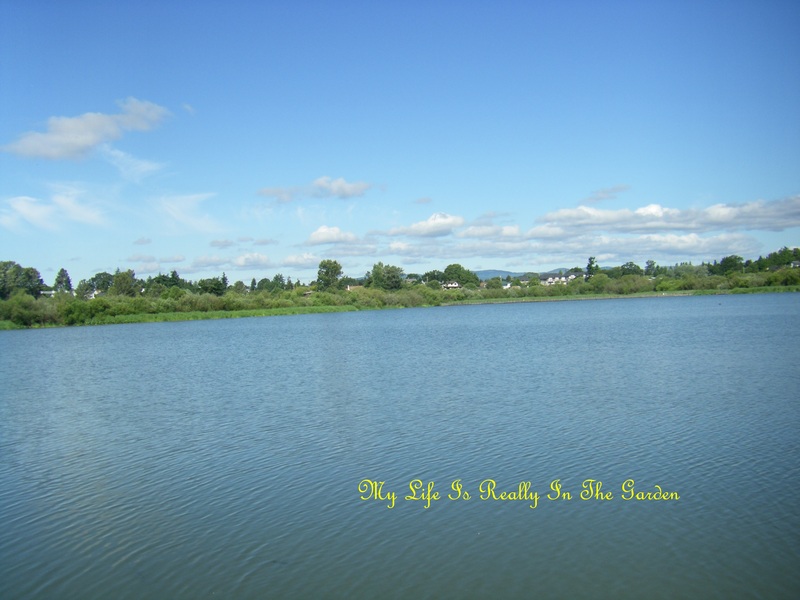 A sunny walk at Swan Lake .. my daily walking adventures continue! Lovely summer days, not sure if it is officially summer yet ..but we’ve had quite a few (more than 3!) days of warm sunny weather. And, yeah, yesterday I began again my lovely long morning walks. I’d started the year out well, walking and exercising .. however, that had to be put on hold for a number of months while DH and I worked on the landscaping of our rental. Now that is complete and my walking adventures continue! Lovely border flourishing at the edge of the local allotment gardens! And this garden area looked most welcoming .. very friendly and open. Farther along .. 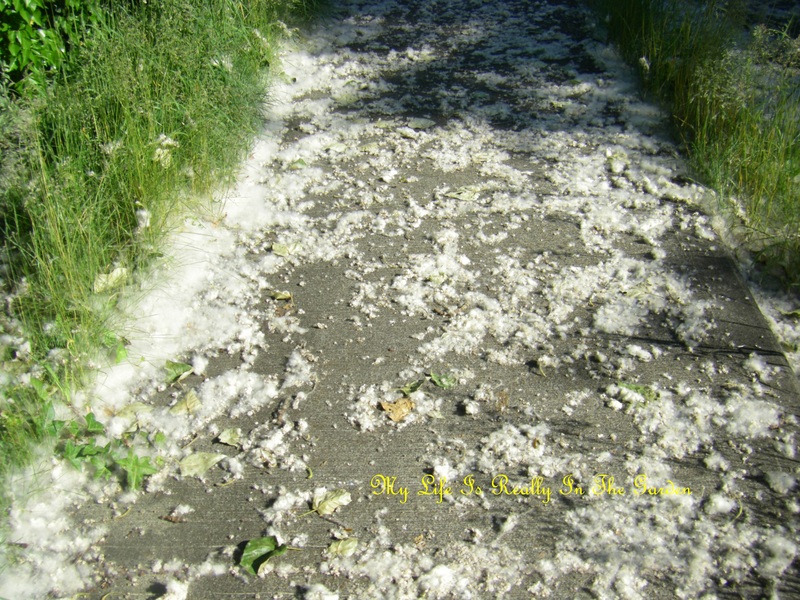 I think this is Cottonwood fluff … looks a lot like snow! Can you see the tiny little dot to the left of the tree trunk? A spritely little Robin poses for a minute. 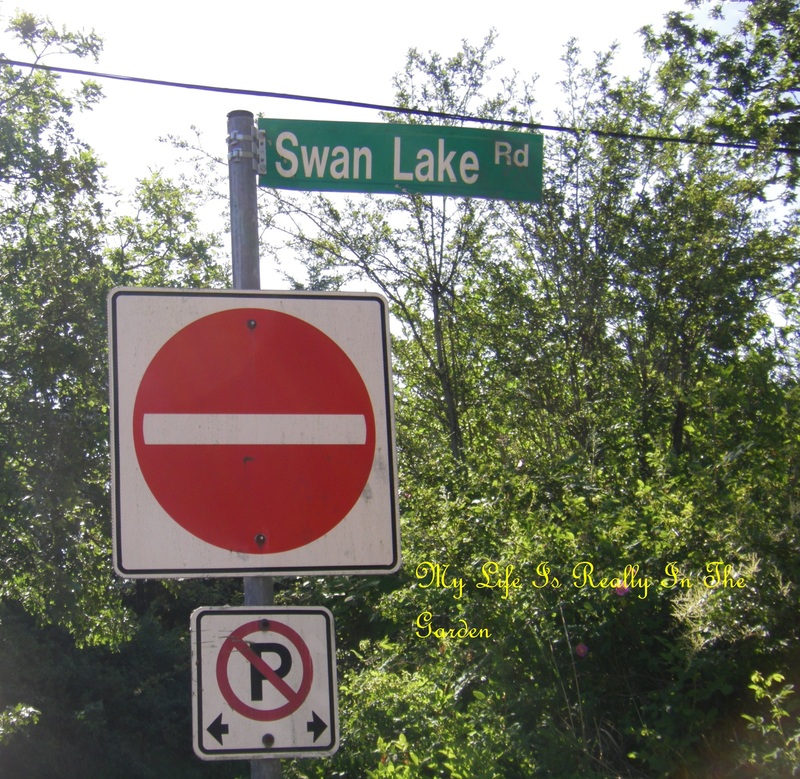 At very long last .. closer to Swan Lake Nature Sanctuary!!!! 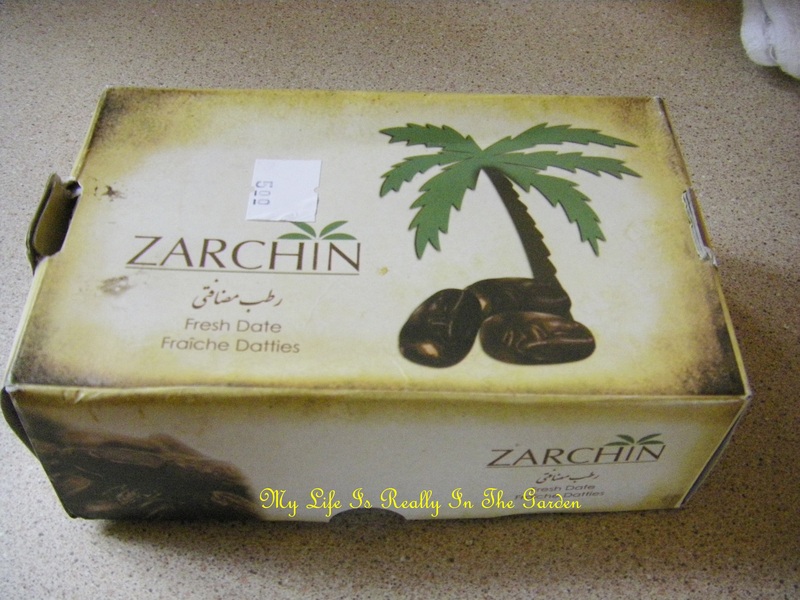 Feels like I”m going home for a visit .. it’s been awhile! Not many people out as I walked along the pathways. Serious birders have most likely come and gone. 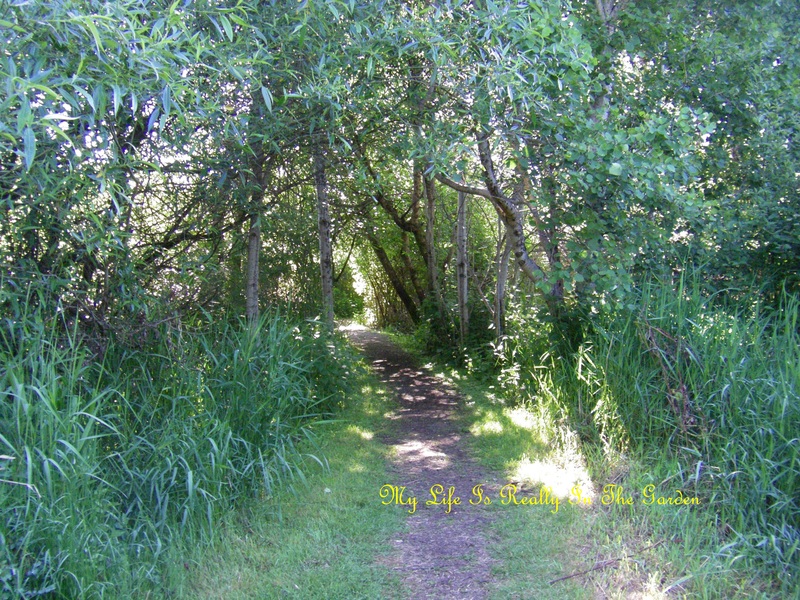 I passed a few joggers and some teenagers .. but otherwise, it was a lovely quiet moment in time. All is quite peaceful at Tuesday Pond .. I’ve missed the baby ducklings and goslings. 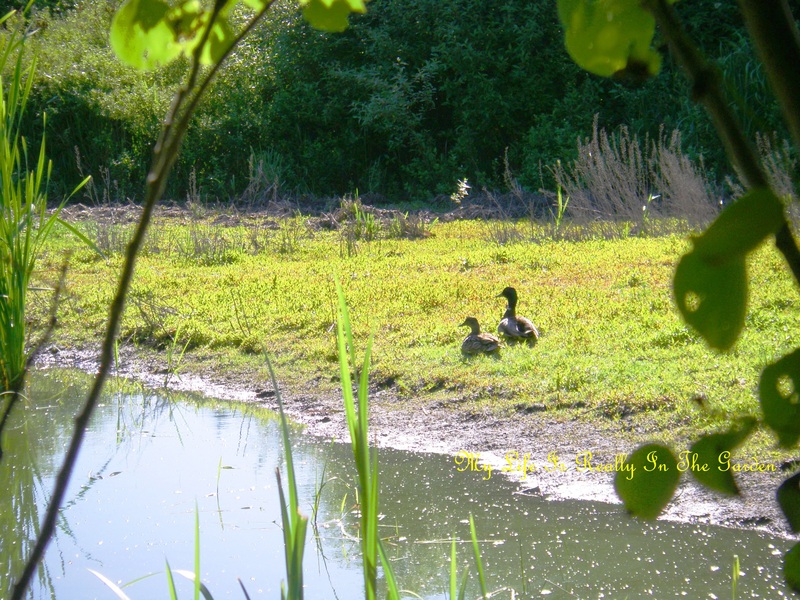 Noticed this couple of Mallards, quickly snapped a photo and silently backed away .. to leave them undisturbed, although they knew I was there. This is their home, after all, and I am but a visitor there. Respect. 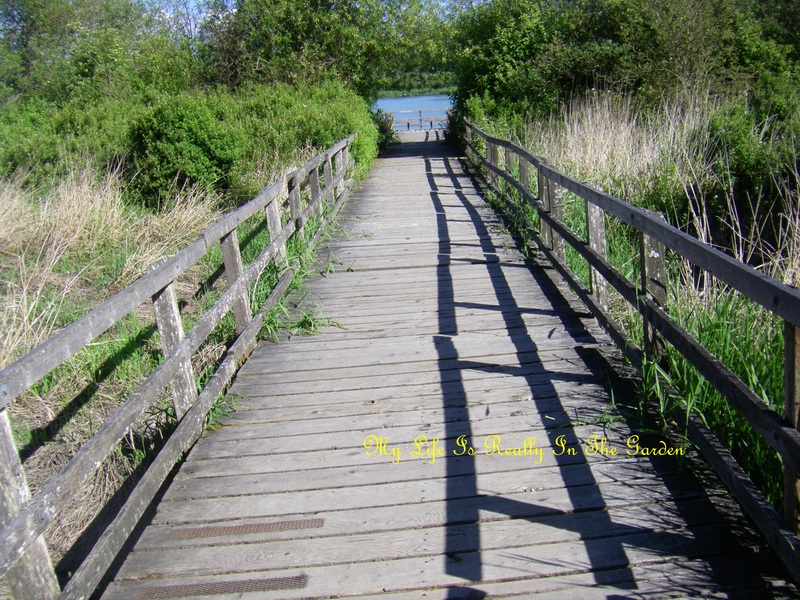 I tiptoed along the little bridge spanning Tuesday Pond, not wanting to disturb the bathing ritual of the little Robin below. 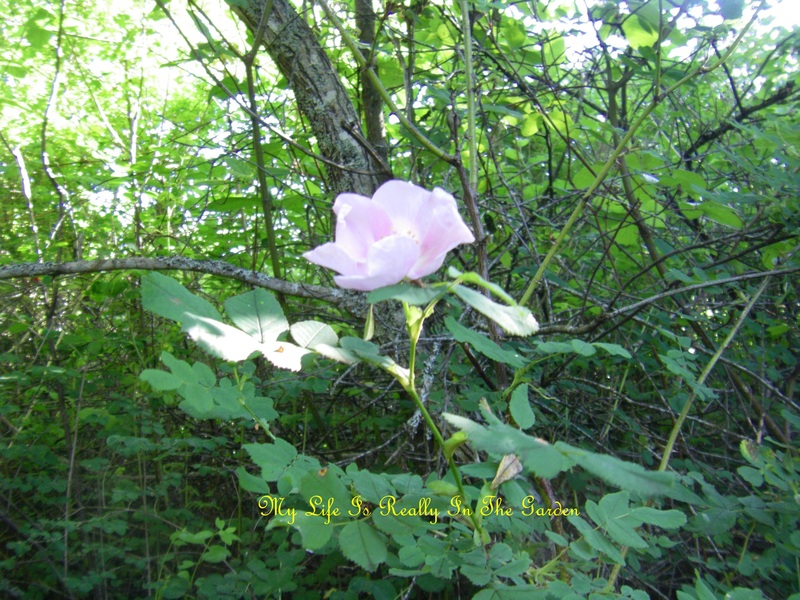 One of the million or so wild roses blooming .. scenting the air with their most beautiful perfume ..
Next I notice the hawk perched high above .. overseeing the Sanctuary . . he knows I’m there and turns his heard around several times to stare at me as lift my little camera to take a photo. Decides I’m not going to cause any trouble … so that’s a good thing! 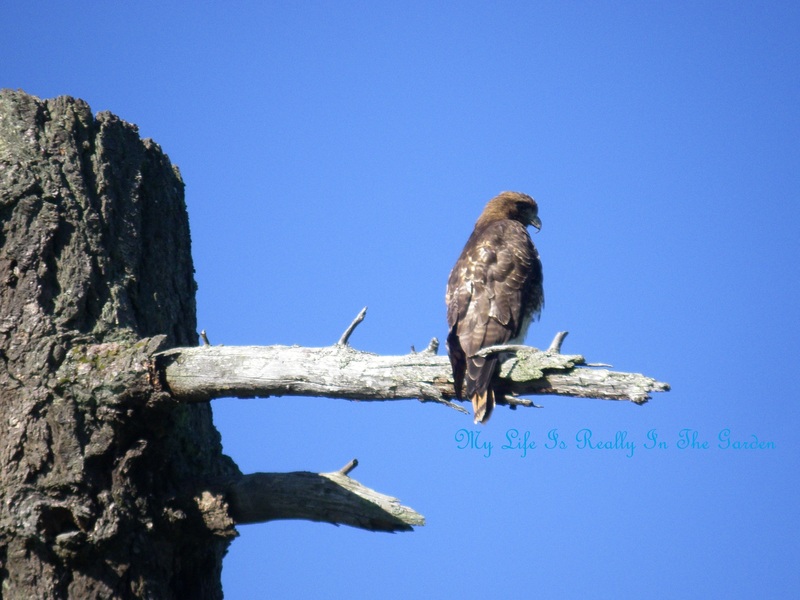 A loose feather is plucked out .. and I watched as it tumbled … floating gently into the blackberry bushes below. 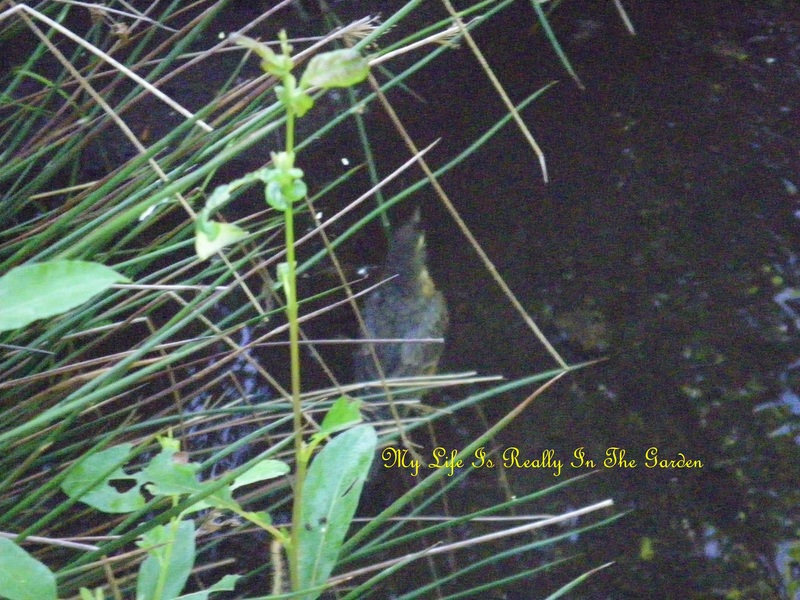 I was so tempted to wade into the chest-high grasses to retrieve it, but decided to leave it. I even stepped a few feet into the grass, but realized that the odds of finding the feather in the thick growth of blackberries that surrounded the base of the tree were slim to none. Leaving the Hawk to continue his search for breakfast .. I continued on my way. What a wonderful way to start the day! And then I spent the rest of this most marvellous day playing in the yard. Mulching the garlic beds with the seaweed that D & I collected last week. This garlic crop is stupendous. 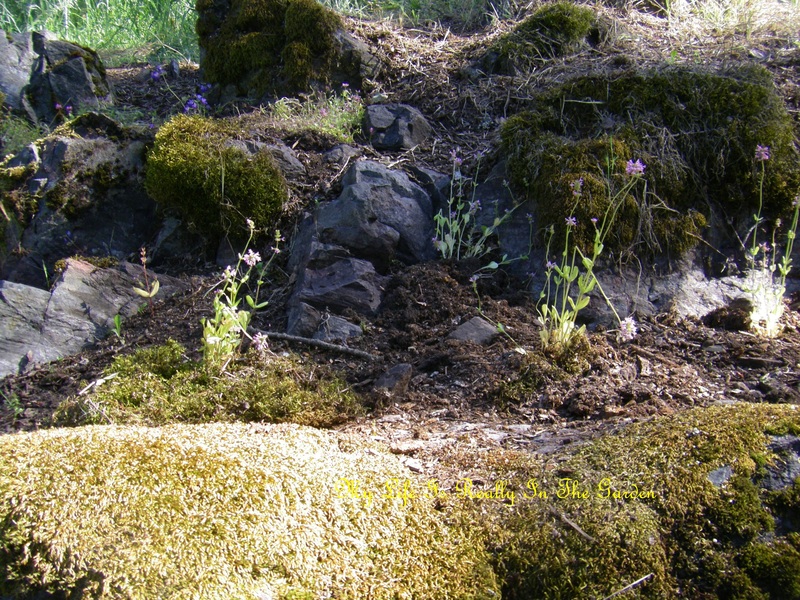 Some of the soft necks were growing out of the ground and they were huge! Also. although I’d planted the cloves some distance apart, somehow, during the winter, some of them had converged into groups of 2 and 3!! Ah well .. time for another walking adventure and backyard gardening! 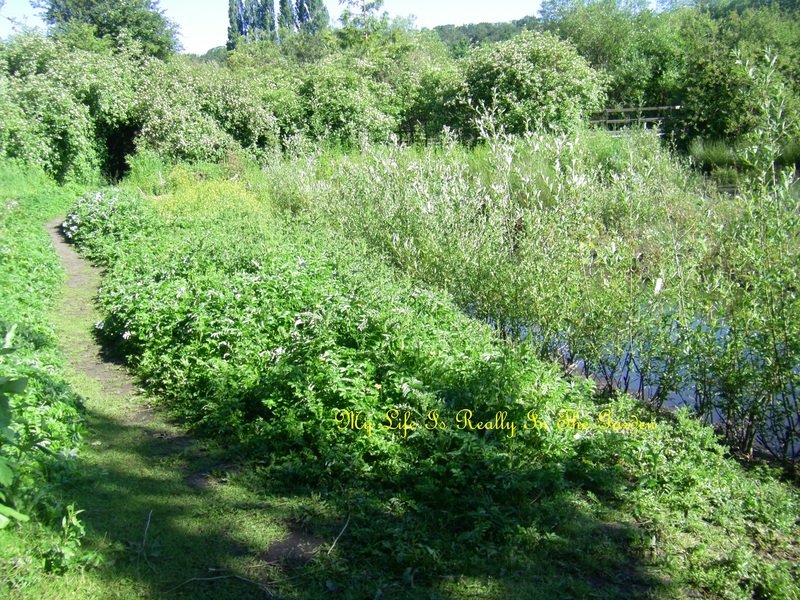 Categories: Gardening | Tags: allotment gardens, Allotments, baby ducklings, Garden, Home and Garden, Mallard, nature, outdoors, plants, Robin, warm sunny weather | Permalink. Mason bees, sunny skies and I have Garry Oaks growing in the garlic forest! A brilliantly beautiful sunshiny day! Birds are chirping away (I replenished the feeders yesterday!) And I am facing a full day of playing away in the garden. Massive amounts of potting up with my many seedlings! This year I’ve putsquash plants in containers .. as I’ve used most of my veggie garden for garlic!! And there is one section left in the sunny area for veggies. There I’ve planted some squash, shallots and there is still room for squash there. 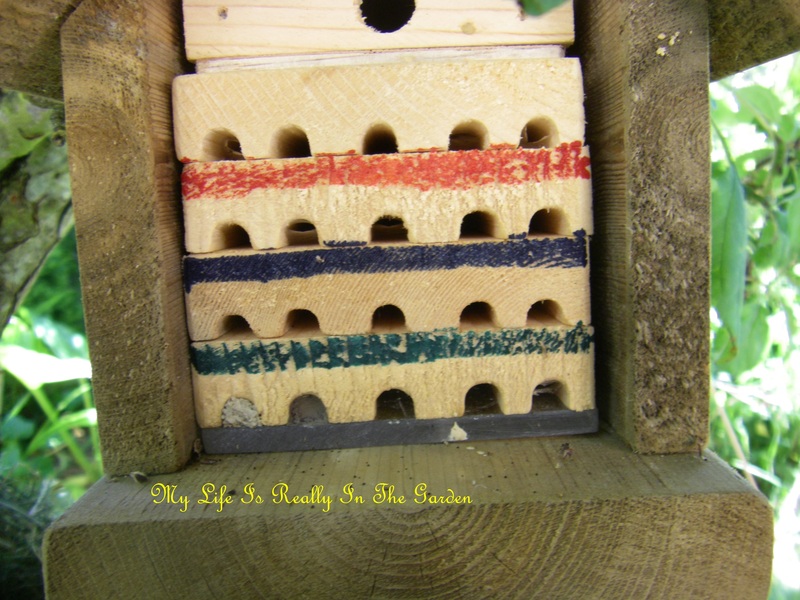 This year I’d purchased Mason Bees with nesting trays … and I’d placed their little home on the trunk of an old apple tree. How exciting it has been to check throughout the spring to see the cocoons open up and know that nature is taking its course and the bees are out in the world. Although I wondered where they were .. I’d seen a variety of bees buzzing away in the yard but hadn’t noticed any of the little black bees. So yesterday I ventured to their home and saw that the two lower sections were sealed shut! This led me to search for more information on these industrious creatures and I found this very informative site: http://www.crownbees.com/life-cycle-of-the-mason-bee/ and sure enough, as the site notes, the bottom 2 left openings are filled in. This site lists absolutely everything I need to know about raising my little winged family .. how exciting! 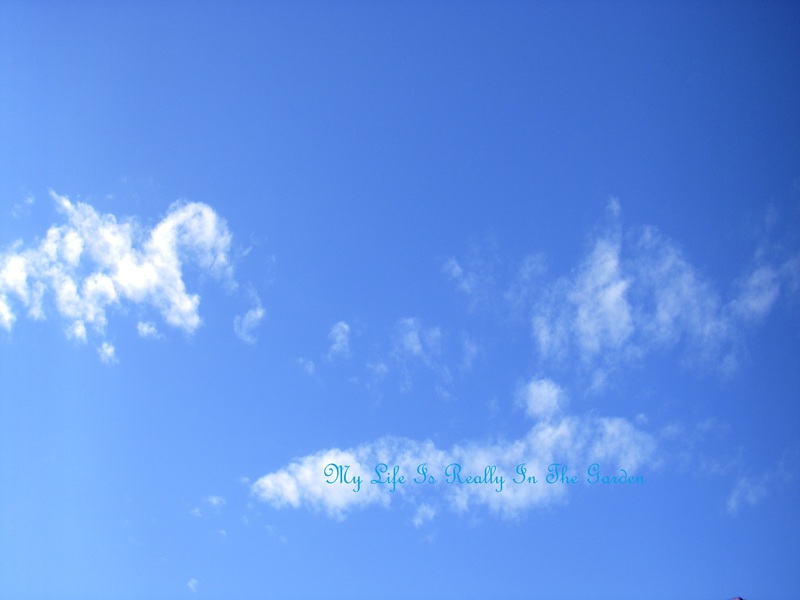 Lovely blue skies again … how cheerful and uplifting to have this overhead! 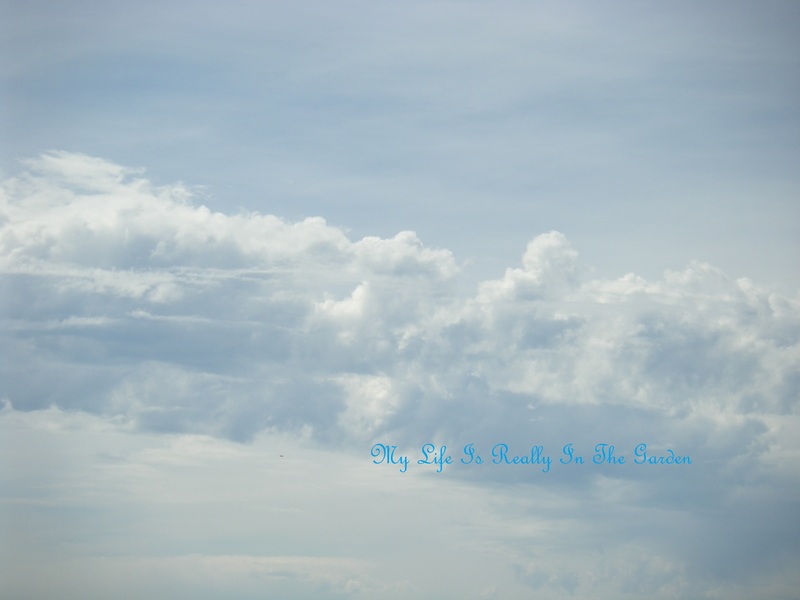 My umbrella has the same scenery on the inside .. more incentive to go for long walks in the rain with a view like this! 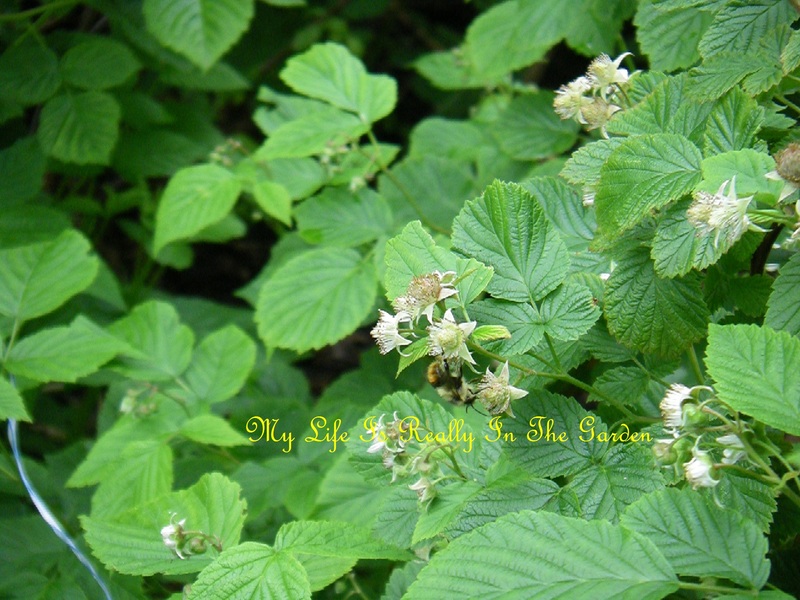 One of the many other busy bees in the yard …. lots of pollinators for all growing plants and trees throughout the yard. 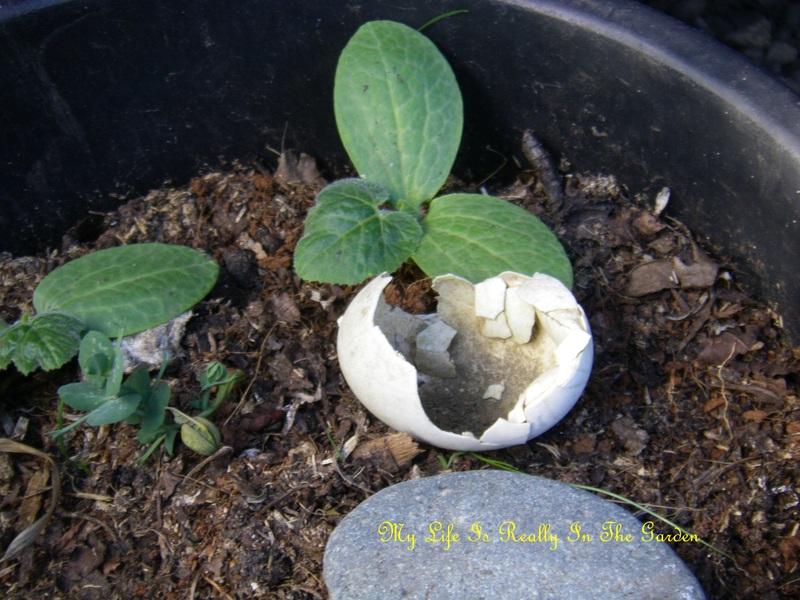 Found this broken egg shell when D and I were out walking at Sooke last week. We were in an area that normally was inaccessible unless we were ducks, however, the tides were way out. 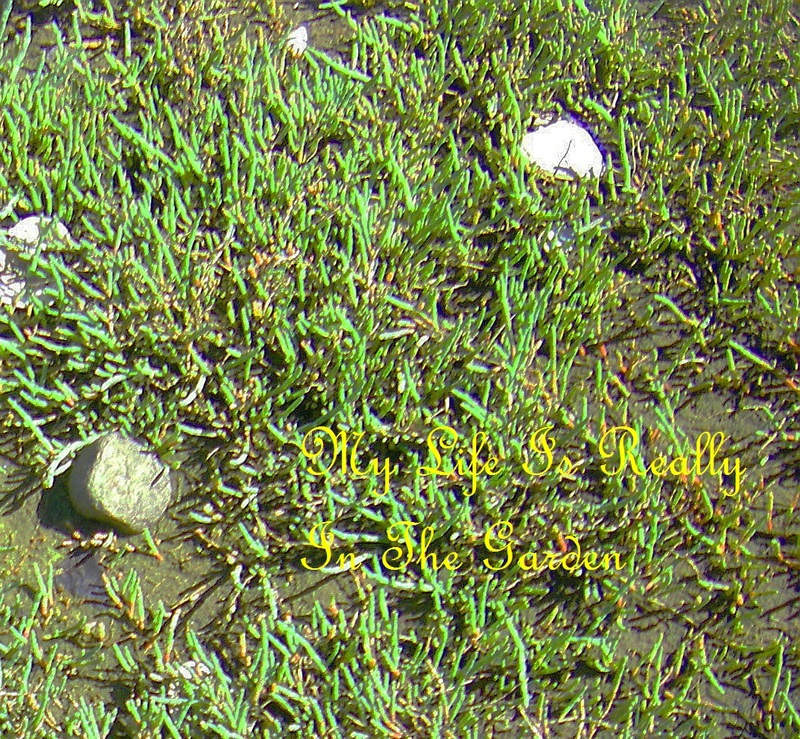 She has a good knack for finding things that are just not really evident .. perhaps this is a Heron’s egg? It is very large, bigger than any I’ve ever seen … so I took it home for a souvenir. I’ve placed it beside some squash shoots for a comparison. Look .. 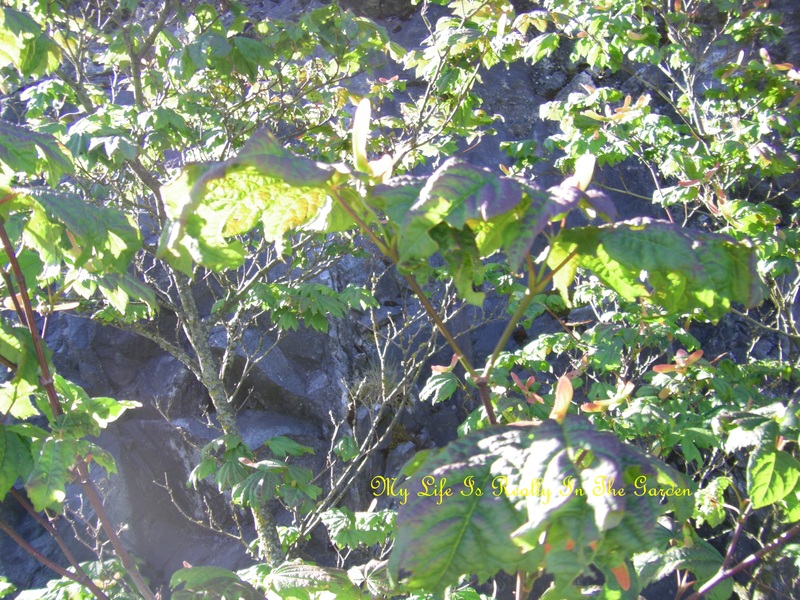 I have Garry Oak growing in my garlic forest! Actually there are a number of them and I’ve potted up quite a few. 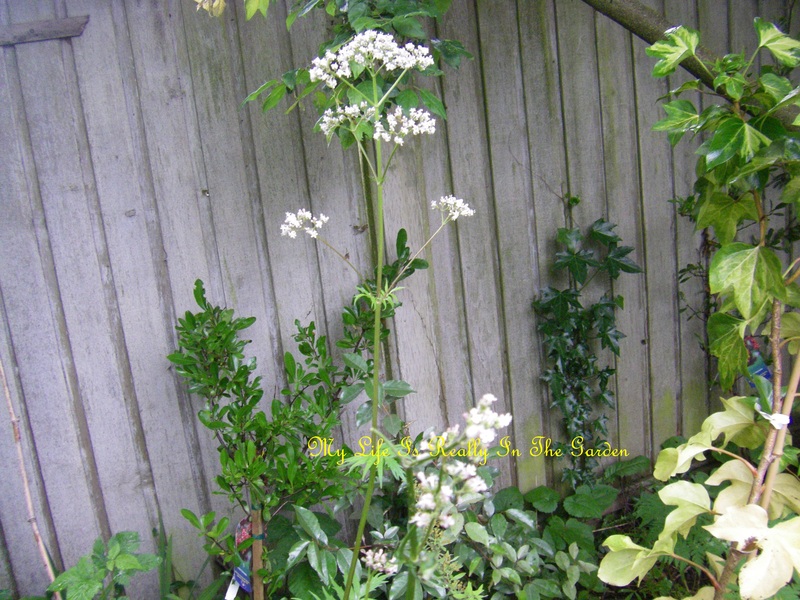 When I harvest the garlic, I’ll pot up the oaks growing in the garlic .. don’t want to disturb them unnecessarily. Well .. time to go for a walk in the sun and then, oh joy, to work in my garden! 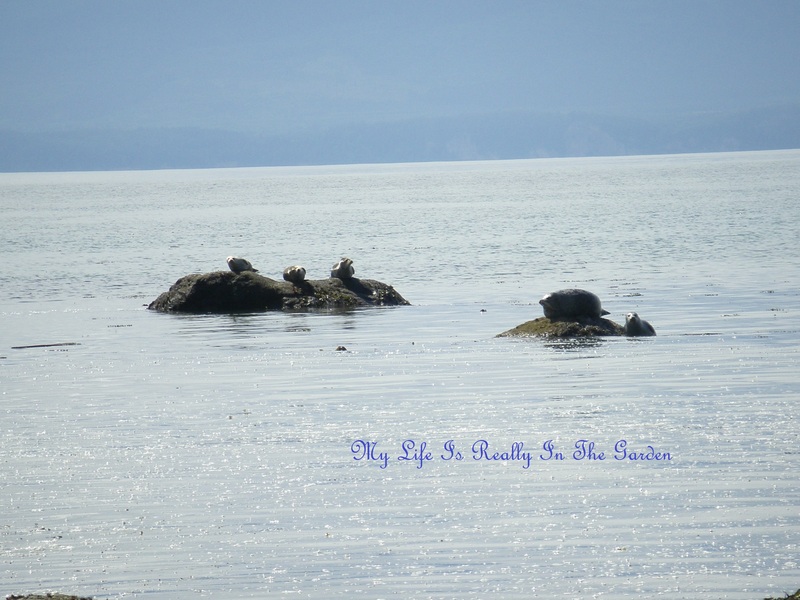 Another day at the beach … gathering seaweed .. breathing in the fresh ocean air .. and there were seals out there! 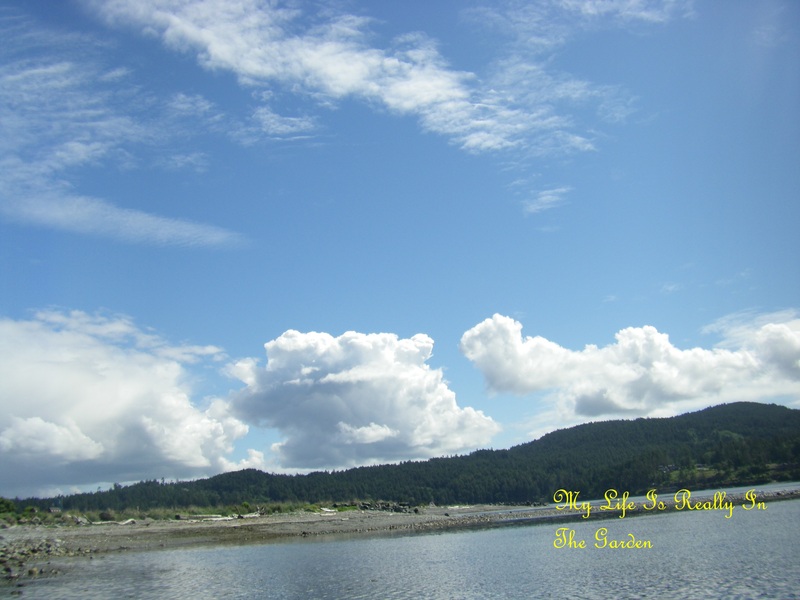 Lovely lazy Sunday … slightly overcast and then the sun broke out of the clouds, yea!!! 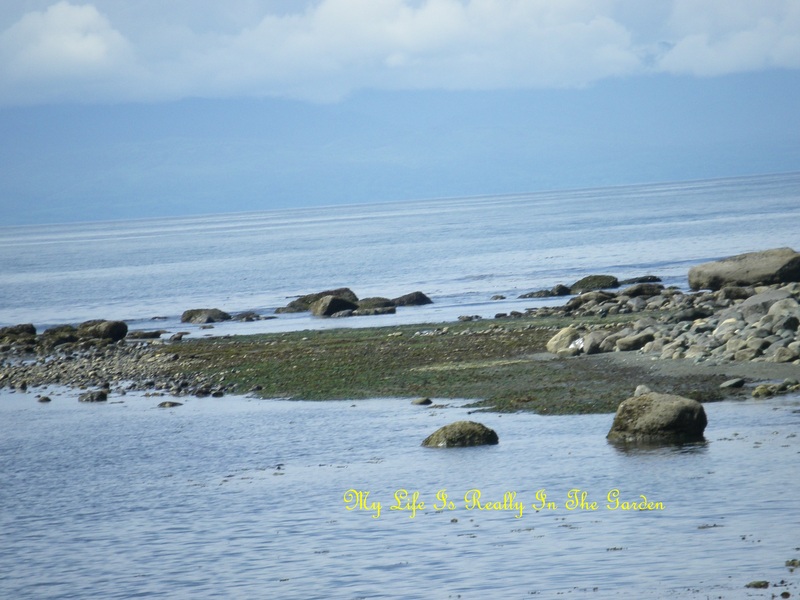 Friday my pal D and I ventured out to Sooke to gather some seaweed for gardening. It was a most beautiful day. 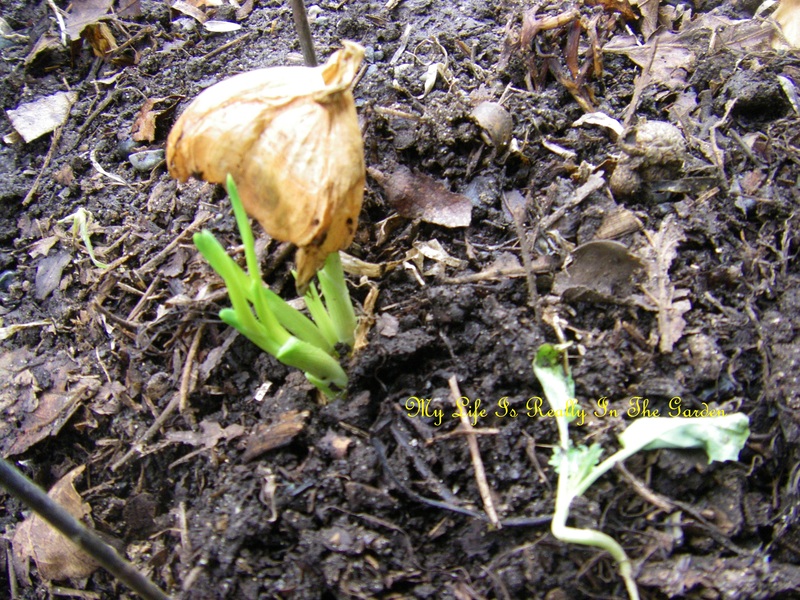 First thing, though, had to check on my shallots .. hadn’t grown them before and had purchased some Dutch shallots from Richters Herbs… here is one of them .. shedding the papery husk of the original bulb .. I thought this was worthy of the “magic” of gardening so thus the photo. They are tenacious growers and I would like to plant more of them. Maybe I’ll get into a shallot growing frenzy as I have done with garlic! 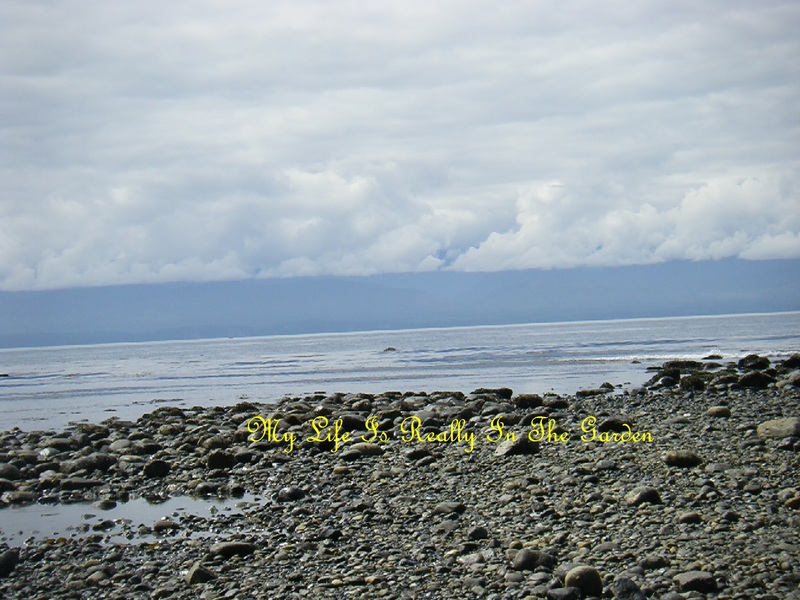 Ok, so D and I arrive at one of the many beaches in Sooke .. what a magnificent day. And both of us are experiencing issues near our homes, where vast building projects are ongoing and we really need some natural beauty to offset the construction issues. This s a good start. 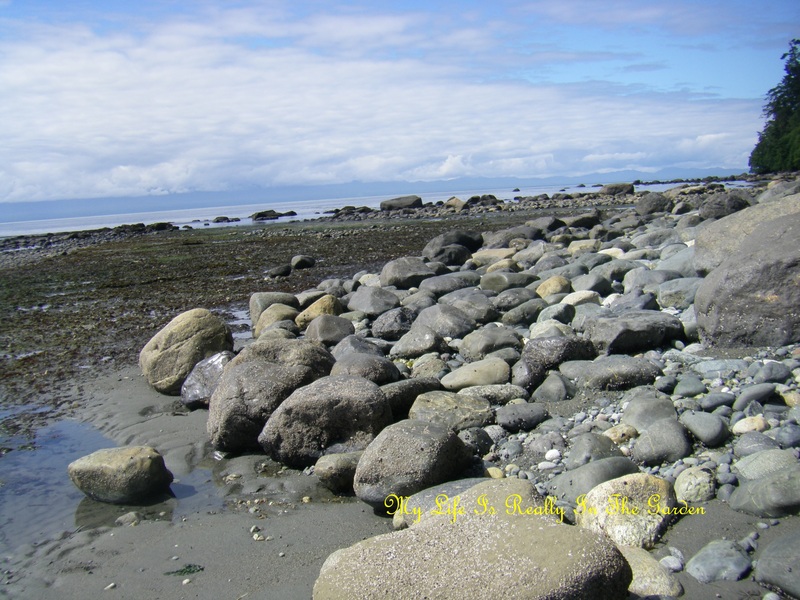 The stones are placed so artistically along the shoreline … now this is real art .. the natural kind. It was a lovely outing, escaping to nature. No cranes. No trucks. No hammering. 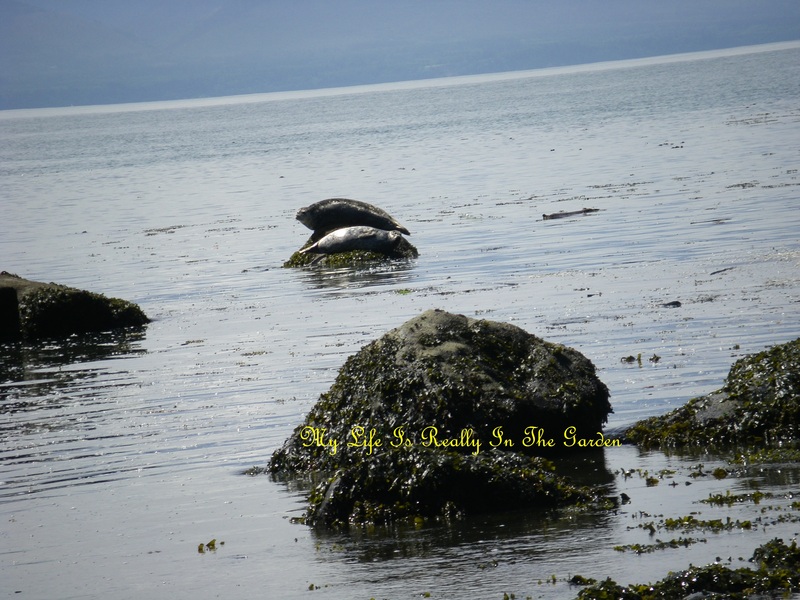 Just the soothing sounds of the waves off in the distance .. a warm breeze swirling around us as we gathered seaweed. Now that was a lot of work and we quickly filled some bags which I loaded into my trusty little car. 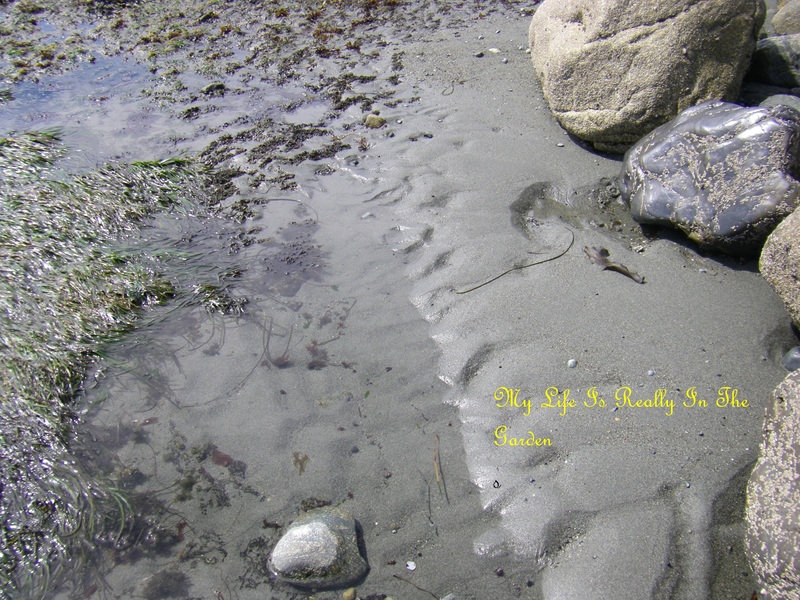 Then it was time to relax and go for a walk along the shoreline. The tide was way out there …. I could see tiny crabs and lightning fast little fishes darting in all directions below. 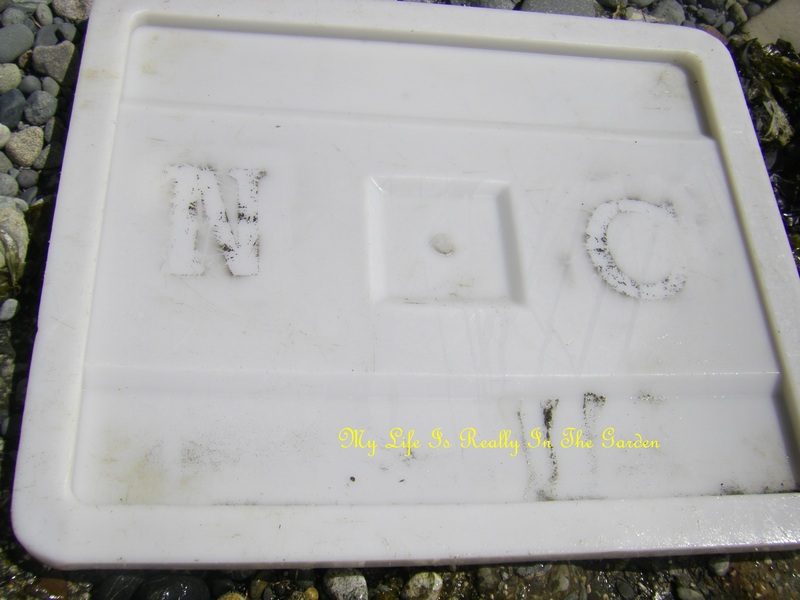 And D noticed this large piece of heavy industrial plastic .. it looked like a hatch cover. Would have liked to have removed it from the beach but it was very heavy, so we had to leave it there. 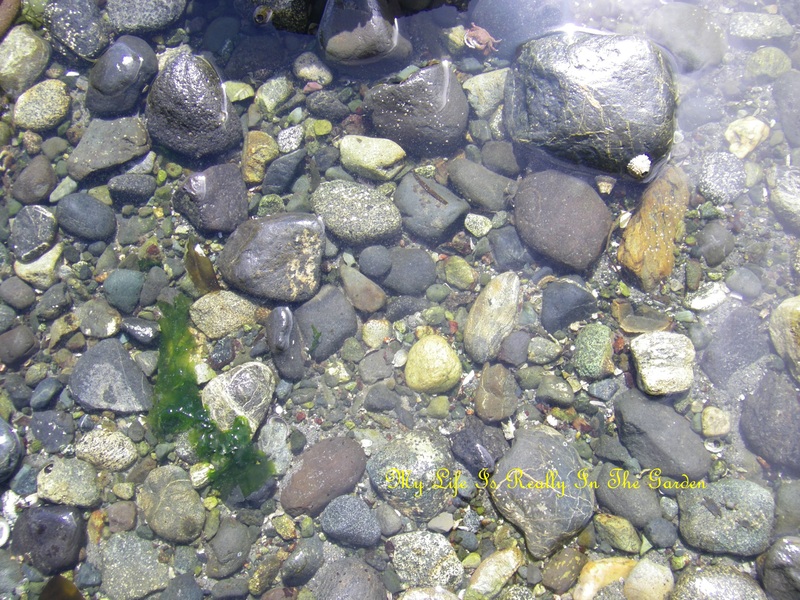 Such a relaxing sight to see the myriad of stones beneath the clear saltwater. And I learned from D that this is sea-asparagus. Served in fine restaurants, imagine that. Most likely not cheap, either. 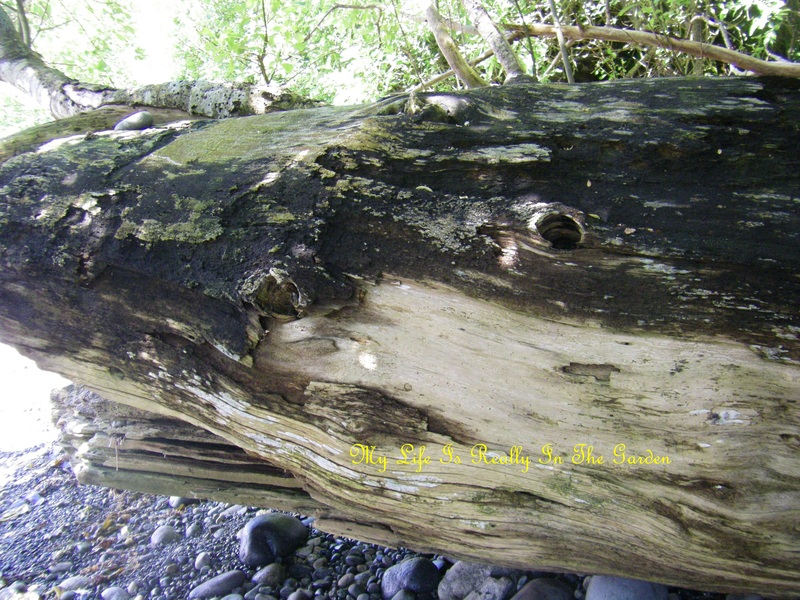 This ancient log resembles a whale, don’t you think? 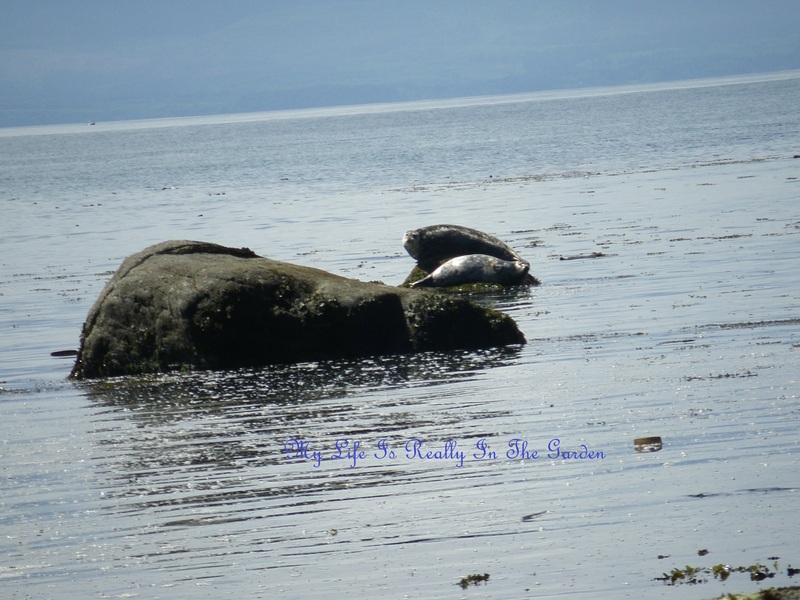 More seals …enjoying their natural habitat .. It was a fun relaxing day trip and finally it was time to leave . 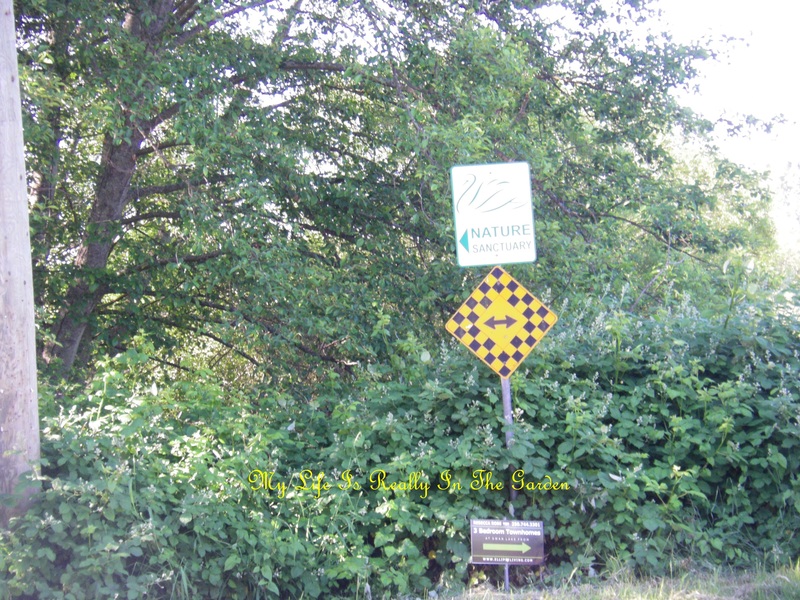 However, we did stop along the way and went for another walk in a small forested area along the highway … where the fronds of the ferns were now unfurled and the well-worn pathways were edged with fields of them. 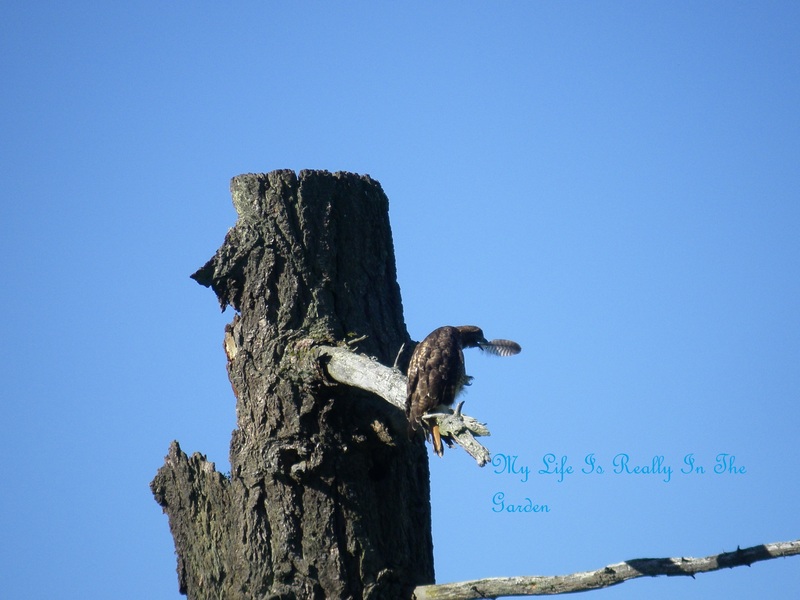 Photos tomorrow .. now it is time to work outside .. to enjoy the one day of the week when the construction noises cease and I can pretend that today is like the normal days of years ago .. when quiet was normal. sigh. 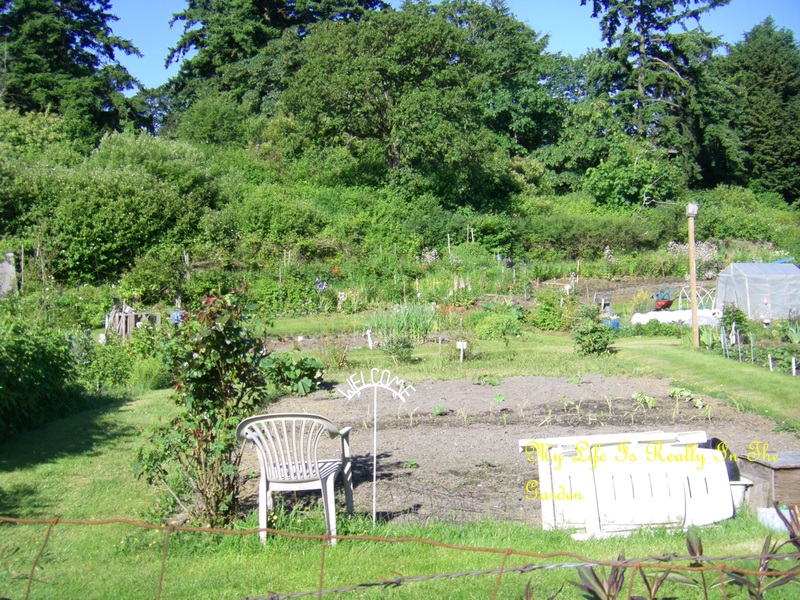 Categories: Gardening | Tags: Beach, construction issues, Friday, Gardens, Home, little fishes, papery husk, Plant, richters herbs, Seaweed, Sooke, Sooke British Columbia, soothing sounds | Permalink.